To Cite: Saffarpour S, Shabani M, Taheripak G, Esmaeili-Mahani S , Janzadeh A, et al. The Alteration of Hippocampal BDNF Expression Is Associated with Anxiety-Like Behavior Following the Injury to the Sciatic Nerve, Arch Neurosci. Online ahead of Print ; 6(1):e74029. doi: 10.5812/ans.74029. Background: BDNF is a critical regulator of the cognitive functions of the brain. According to the modulatory role of BDNF in the chronic pain state, this study focused on changes in BDNF expression in the hippocampus and anxiety-like behavior, following an injury to the sciatic nerve. Methods: 30 adult male Wistar rats were randomly divided into three subsets as neuropathic, sham, and control. The neuropathic pain was induced due to chronic constriction injury of the sciatic nerve. Anxiety-like behavior was observed using the open field and elevated plus-maze tests. The level of BDNF was determined by real-time polymerase chain reaction analysis. Results: The results showed that the pain threshold decreased two weeks after CCI. Simultaneously, there was a decrease in the BDNF levels (P < 0.001, F = 15. 03). In addition, the anxiety-like behaviors increased in the open field (P < 0.01, F = 25.67; P < 0.05, F = 23.02) and elevated plus-maze (P < 0.05, F = 6.01; P < 0.001, F = 5.95) tests. In the third week after CCI, the increased pain threshold was accompanied by an increase in the level of BDNF, latency to leave the first quadrant, number of rearing behaviors (P < 0.05, F = 26.07, F = 24.04), and time spent in open arms (P < 0.05, F = 5.30) while time spent in closed arms decreased (P < 0.05, F = 4.70). Conclusions: Alteration in BDNF expression is involved in CCI-induced anxiety-like behavior. Brain-derived neurotrophic factor (BDNF) is a member of the neurotrophin family. BDNF regulates many important brain operations such as synaptic and cognitive functions in the adult brain. Neurotrophins like BDNF are the secreted proteins whose expression and release are upregulated by neuronal activity. In the hippocampus, BDNF modulates glutamatergic and GABAergic activity (1). Furthermore, the increased BDNF expression during cognitive tasks has been demonstrated in the hippocampus. Clinical studies have suggested that lower levels of BDNF decrease the volume of the hippocampus and mediate age-related cognitive deficits whereas increasing BDNF appeared to improve hippocampal atrophy and memory function (2). Alteration in BDNF, synaptic plasticity, and synapse dynamics are subsequently involved in anxio-depressive disorders. The neurotrophic theory of depression and anxiety suggests that stressful conditions improve BDNF signaling pathway in the hippocampus; however, antidepressant and anxiolytic drugs actuated this pathway (3, 4). BDNF actively involves in the pathogenesis of neuropathic pain in the spinal cord, but less information is available about the supraspinal alteration of the BDNF level during chronic pain situations (5). BDNF contributes to the sensitization of pain pathways in higher brain centers. It can also be involved in the maintenance of neuropathic pain. A previous study suggested that the alteration in supraspinal cytokines and neurotrophin levels could parallel neuropathic symptoms (6, 7). However, recent data have indicated that a reduction in BDNF in the limbic system is associated with pain-cognition disorders. Another study found that the intracerebroventricular injection of BDNF ameliorated chronic pain, as well as pain-related anxiety and depression (8). Besides distinct outcomes, this assay was conducted to evaluate the correlation between hippocampal BDNF expression and the anxiety-related behavior in the sciatic nerve injury model of neuropathy. Adult male albino Wistar rats weighing 250 - 300 grams were purchased from Pasteur Institute of Iran and kept in a 12-hour light/dark cycle in a temperature controlled room (22 ± 2°C) with food and water available ad libitum. The animals were assigned to three experimental groups with 10 animals in each group in a random way. All tests followed the guidelines of the Committee for Research and Ethical Issues of the International Association for the Study of Pain (IASP) and they were approved by the ethics committee of the university. The chronic constriction injury (CCI) model introduced by Bennett and Xie was used to induce neuropathic pain (9). Briefly, the rats were anesthetized using sodium pentobarbital (40 mg/kg intraperitoneally) and a neat cut was made in the left thigh. After the sciatic nerve showed, four loose ligatures were made around the nerve using 4-0 chromic tread. The ligatures were placed at an interval of 1 mm. The rats endured sham surgery where the left sciatic nerve was exposed with no ligatures. The acetone test was used to measure cold allodynia following a modification described by Vissers and Meert (10). A drop of acetone was applied to the plantar hind paw. The time spent with reactions such as licking, lifting, and shaking of the paw was monitored using a stopwatch for a period of 90 seconds. The frequency of foot withdrawal was expressed as the percentage, according to the below formula: the number of trials as foot withdrawals divided by the number of total trials multiplied by 100. The acetone test was carried out on the days 14 and 21 after CCI or sham surgery. According to the methods described previously (11), the rats were examined by the open field apparatus. For 5 minutes, the latency to leave the first quadrant, the number of line crossings, and the number of rearings (upright posture) were recorded and calculated using a computer-based video tracking system (Ethovision 1.6 Noldes, Waninggen). The total numbers of crossings and rearings were respectively identified as motor and exploratory activities of the rats. The latency to depart the first quadrant was considered as the quantity of anxiety. The OFT was achieved on the days 14 and 21 after CCI or sham surgery. The maze was cleaned after each trial. The anxiety-like behaviors were assessed by using the EPM test, according to the methods described by Filho et al. (12). The parameters were determined in video records as the total time spent in closed and open arms and the number of non-protected head-dipping (NPHD) movements during a 5-min period for each animal (Ethovision 1.6 Noldes, Waninggen). The rats’ entries were considered when all four paws were inside the arm. When the rat put its head over the left or right border of the maze in an open arm, the non-protected head-dipping movements were debated to occur and the NPHD was recorded. The EPM test was carried out on the days 15 and 22 after CCI or sham surgery. The maze was cleaned after each trial. The hippocampus tissue was frozen in liquid nitrogen to be ready for total RNA extraction and reverse transcription. Trizol (Invitrogen, Carlsbad, CA) was used for the total RNA isolation. 2 μg RNA was reverse transcribed using Super-Script™ II Reverse Transcriptase (Invitrogen) and 0.5 μg random hexamers (Promega, Madison, WI) in a 50 μL final volume. Real-time PCR was performed according to the manufacturer's instructions. Double-strand DNA was discovered by applying a Light-Cycler rapid thermal cycler System (Roche Diagnostics, Mannheim, Germany) and SYBRGreen. The PCR reaction was configured in a total volume of 20 μL with 2 μL of cDNA and 2 μL of Light Cycler DNA Master SYBR Green I (Roche Diagnostics). The BDNF was quantified by using forward AGCTGAGCGTGTGTGACAGT and reverse ACCCATGGGATTACACTTGG primers, while for β-actin quantitation, noted as the internal control, forward GGGAAATCGTGCGTGACATT and reverse CGGATGTCAACGTCACACTT primers were used. The PCR program included the following conditions: the initial denaturation step for 30 seconds at 95°C, followed by 45 cycles of a 1 second denaturation step at 95°C, a 10 second annealing step at 58°C, and a 10 second extension step at 72°C (all temperature transition rates were 20°C/s). At the end of each cycle, the fluorescence acquisition was measured by SYBR Green. Finally, in order to identify primer specificity, the samples experienced an increasing temperature from 70°C to 95°C at 2°C/s with continuous fluorescence monitoring. For each PCR product, a dissociation curve was obtained by melting curve analysis at the specific temperature. The analysis was achieved by Light Cycler Relative Quantification Software and each sample was examined in duplicate. The samples containing no template were considered as negative controls in the tests. Mean comparisons of data on the cold withdrawal threshold (acetone spray test), BDNF levels, the OFT and EPM test parameters were made with one-way ANOVA followed by Tukey post hoc test with SPSS21. P < 0.05 was considered significant. A one-way ANOVA test was used to compare the response rates to acetone drop between sham and CCI animals. The Post hoc analysis revealed that cold hypersensitivity after CCI significantly developed within 14 days (P < 0.001, 20.28 ± 5.07) and reduced on the day 21 (P < 0.001, 16.8 ± 4.8). No statistical differences were noted in the sham group compared to the control group (12.3 ± 3.60, 11.16 ± 3.06, 8 ± 3.26). Data are shown in Figure 1. Figure 1. Comparison of cold allodynia between CCI, on days 14 and 21 after surgery, sham, and control groups. **P < 0.01 and***P < 0.001 indicate the difference between the groups. Data are expressed as mean ± SEM of ten animals per each group. An open field test was carried out to assess the neuropathic pain-related anxiety-like behavior. The ANOVA showed differences between the groups in the latency to leave the first quadrant (P < 0.01, F = 25.67) and the number of rearings (P < 0.05, F = 24.04). The CCI group on day 15 showed an increase (14.1 ± 0.63). 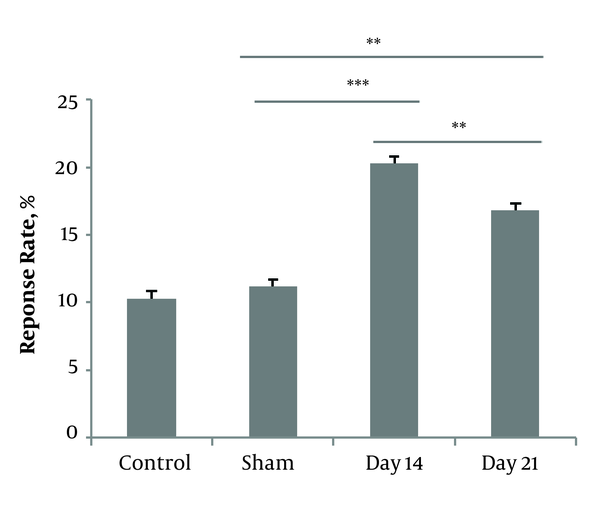 Post hoc analysis revealed rearing activity in the CCI group on day 15 (12 ± 0.28) was less than that in the sham group (23 ± 0.34) and the CCI group on day 22 (26 ± 0.3). There were no differences in the number of line crossings between the groups (Figure 2). Figure 2. The effect of chronic constriction injury on open field test (OFT) on days 15 and 22 after surgery. Latency to leave the first quadrant (A), the number of total crossings (B), and the number of rearing behaviors (C) were measured. *P < 0.05 and **P < 0.01 indicate the difference between the groups. Data are expressed as mean ± SEM of ten animals per each group. The elevated plus-maze test was performed to investigate the effect of the peripheral neuropathy on anxiety-like behavior. One-way ANOVA showed that on day 15, the CCI group spend more time in the closed arms (240.86 ± 12.26) compared to the sham group (150.23 ± 10) and the CCI group on day 22 (180.89 ± 12). 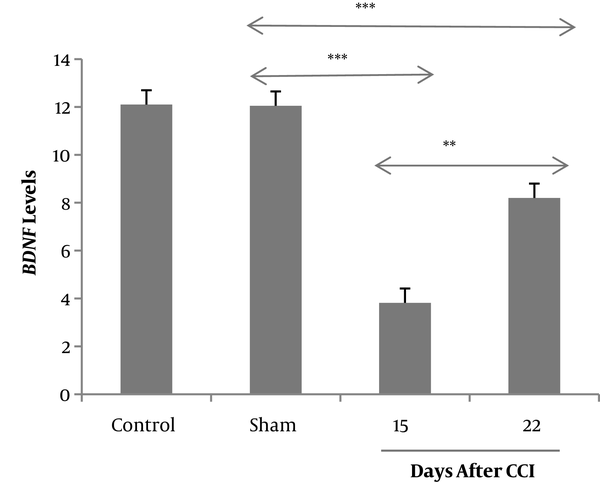 Additionally, the CCI group on days 15 and 22 spend less time in open arms (2.79 ± 0.85, and 10.46 ± 2.05, respectively) compared to the sham group (22 ± 1.28). The CCI group showed decreased frequency of NPHD movements on days 15 and 22 (0.3 ± 0.01 and 0.89 ± 0.02, respectively) compared to the sham group (1.8 ± 0.02) (Figure 3). The changes in the BDNF levels in the hippocampus were investigated by using real-time PCR on days 15 and 22 after CCI or sham surgery. One-way ANOVA showed that the rats in the CCI group expressed significantly a lower level of BDNF mRNA (3.82 ± 0.79) compared to the sham group (12.05 ± 0.27), and pain alleviation in the third week was associated with increased level of mRNA BDNF (8.2 ± 0.63) (Figure 4). Figure 3. The effect of chronic constriction injury, on the elevated plus maze (EPM) test, on days 15 and 22 after surgery. The total time spent in the closed arms (A), total time spent in the open arms (B) and the number of non-protected head-dipping movements (NPHD) (C) were evaluated. *P < 0.05, **P < 0.01, and ***P < 0.001 indicate the differences between the groups. Data are expressed as mean ± SEM of ten animals per each group. Figure 4. Expression of BDNF mRNA in the CA1 region of hippocampus via real-time PCR after probe trial of Morris water maze task on days 15 and 22 after CCI or sham surgery. **P < 0.01 and ***P < 0.001 indicate the differences between the groups. Data are presented as means ± SEM of four animals per each group. Our results showed that chronic constriction injury of the sciatic nerve is associated with anxiety-like behavior. In addition, we found that CCI could alter BDNF expression in the hippocampus on days 15 and 22 after injury, and probably provide an explanation for anxiety disturbance caused by chronic pain. We selected this time point because the maximum pain sensation occurred two weeks after CCI. However, it was considered that the fibers began to regenerate from the third week and this regenerative activity is linked to the increasing pain threshold in the CCI model (9, 13). Many clinical assays have identified that chronic pain is related to cognition and mood disorders (13). However, the exact mechanism by which the chronic pain induces these deficits has not been clarified. The present study followed chronic constriction injury by OFT and EPM tests since they measure anxiety-like behavior, movement control, and cognitive mapping. The current study demonstrated that neuropathic pain could induce anxiety-like behavior. Recent studies have confirmed that neuropathic pain might initiate affective disturbances (14). Data of our OFT showed that CCI surgery has a little effect on motor function, implying that anxiety-like behaviors after sciatic nerve injury are not related to motor dysfunction. The findings of this study indicated that the BDNF level reduced in the hippocampus while the pain threshold was at the minimum. The hippocampus, which is required for the regulation of mood and cognition in humans and animals, is also responsible for modulating the transmission of pain and is an important site of BDNF action. Hippocampal network activity upregulates BDNF levels in the hippocampus (15, 16). BDNF-related pathways are involved in the etiology of some mood disorders and the development of spatial learning and memory (17, 18). BDNF is also involved in the modulation and progression of neuropathy. In accordance with our data, some results showed that the changes in supraspinal cytokines and neurotrophins are connected with neuropathic pain manifestations (19, 20). Recent investigations have shown that BDNF reduction in the limbic system may result in pain-emotion disorders. These changes could be regulated by increasing the BDNF level (21). This study showed that behavioral changes in OFT and EPM tests might be partly due to the BDNF reduction in neuropathic rats. In particular, we showed that in the second week, CCI anxiety-like behavior was associated with downregulation of BDNF expression in the hippocampus. Alteration of the BDNF level is associated with the pathophysiology of several neurological and psychiatric disorders (22). Previous studies suggested that anxiety and depression decreased the expression of BDNF in the hippocampus and antidepressant treatment could reverse this effect (21, 23, 24). Our data showed that whenever pain is alleviated spontaneously, BDNF expression increases and neuropathic rats show improvement in anxiety-like behavior. However, some studies conducted during three weeks after chronic pain induction failed to illustrate any relationship between chronic pain and anxiety or depression disorders while other assays indicated anxiety and depressive symptoms in some rodent models. It was considered that different chronic pain models provided time-dependent anxiety- or depression-like phenotypes (21). While the effects of CCI are at least in part reversible (9), we showed that following pain reduction at the end of the third week, there was an increase in BDNF expression. Accumulating evidence shows that pain alleviation could reverse the functional and morphological alterations after peripheral nerve injury in chronic pain syndrome. Successful chronic pain treatment appeared to have a protective effect, thus regulation responses could decrease the CCI-induced pain comorbidity (13). In agreement with our result, previous studies revealed that some antidepressants used for chronic pain treatment had an anxiolytic effect and upregulated the expression of BDNF in the hippocampus of neuropathic rats (23-25). The current study found that chronic pain induces anxiety-like behavior and causes changes in hippocampal BDNF expression when pain threshold is minimum. However, this effect could be the reason why the pain was naturally alleviated and BDNF expression increased in the sciatic nerve injury state. This work was a collaboration between the Neuroscience Research Center of Kerman University of Medical Sciences and Physiology Research Center of the Iran University of Medical Sciences and granted by them. It was a part of a Ph.D. dissertation. Ethical Considerations: The experiments adhered to the guidelines of the Committee for Research and Ethical Issues of the International Association for the Study of Pain (IASP) and were approved by the Ethics Committee of the university. Financial Disclosure: All authors have indicated they have no financial relationships relevant to this article to disclose. 1. Chen B, Ma XL, Geng Z, Huang SH, Zhai LK, Guo YY, et al. Up-regulation of c-Jun NH2-terminal kinase-interacting protein 3 (JIP3) contributes to BDNF-enhanced neurotransmitter release. J Neurochem. 2015;135(3):453-65. doi: 10.1111/jnc.13226. [PubMed: 26303065]. 2. Zhang ZH, Wu LN, Song JG, Li WQ. 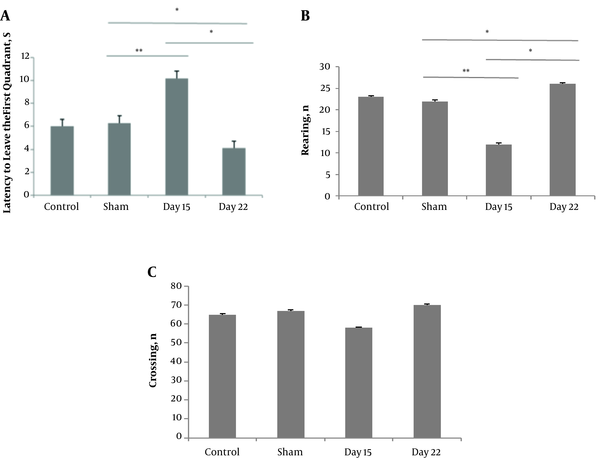 Correlations between cognitive impairment and brain derived neurotrophic factor expression in the hippocampus of post-stroke depression rats. Mol Med Rep. 2012;6(4):889-93. doi: 10.3892/mmr.2012.1009. [PubMed: 22842820]. 3. Autry AE, Monteggia LM. Brain-derived neurotrophic factor and neuropsychiatric disorders. Pharmacol Rev. 2012;64(2):238-58. doi: 10.1124/pr.111.005108. [PubMed: 22407616]. [PubMed Central: PMC3310485]. 4. Nestler EJ, Hyman SE. Animal models of neuropsychiatric disorders. Nat Neurosci. 2010;13(10):1161-9. doi: 10.1038/nn.2647. [PubMed: 20877280]. [PubMed Central: PMC3750731]. 5. Ferrini F, De Koninck Y. Microglia control neuronal network excitability via BDNF signalling. Neural Plast. 2013;2013:429815. doi: 10.1155/2013/429815. [PubMed: 24089642]. [PubMed Central: PMC3780625]. 6. Krishnan V, Nestler EJ. Linking molecules to mood: new insight into the biology of depression. Am J Psychiatry. 2010;167(11):1305-20. doi: 10.1176/appi.ajp.2009.10030434. [PubMed: 20843874]. [PubMed Central: PMC3031089]. 7. Fukuhara K, Ishikawa K, Yasuda S, Kishishita Y, Kim HK, Kakeda T, et al. Intracerebroventricular 4-methylcatechol (4-MC) ameliorates chronic pain associated with depression-like behavior via induction of brain-derived neurotrophic factor (BDNF). Cell Mol Neurobiol. 2012;32(6):971-7. doi: 10.1007/s10571-011-9782-2. [PubMed: 22198556]. 8. Roedel A, Storch C, Holsboer F, Ohl F. Effects of light or dark phase testing on behavioural and cognitive performance in DBA mice. Lab Anim. 2006;40(4):371-81. doi: 10.1258/002367706778476343. [PubMed: 17018208]. 9. Bennett GJ, Xie YK. A peripheral mononeuropathy in rat that produces disorders of pain sensation like those seen in man. Pain. 1988;33(1):87-107. doi: 10.1016/0304-3959(88)90209-6. [PubMed: 2837713]. 10. Vissers K, Meert T. A behavioral and pharmacological validation of the acetone spray test in gerbils with a chronic constriction injury. Anesth Analg. 2005;101(2):457-64. table of contents. doi: 10.1213/01.ANE.0000158471.41575.F0. [PubMed: 16037162]. 11. Zhao Z, Loane DJ, Murray M2, Stoica BA, Faden AI. Comparing the predictive value of multiple cognitive, affective, and motor tasks after rodent traumatic brain injury. J Neurotrauma. 2012;29(15):2475-89. doi: 10.1089/neu.2012.2511. [PubMed: 22924665]. [PubMed Central: PMC3471125]. 12. Filho PR, Vercelino R, Cioato SG, Medeiros LF, de Oliveira C, Scarabelot VL, et al. Transcranial direct current stimulation (tDCS) reverts behavioral alterations and brainstem BDNF level increase induced by neuropathic pain model: Long-lasting effect. Prog Neuropsychopharmacol Biol Psychiatry. 2016;64:44-51. doi: 10.1016/j.pnpbp.2015.06.016. [PubMed: 26160698]. 13. Baliki MN, Schnitzer TJ, Bauer WR, Apkarian AV. Brain morphological signatures for chronic pain. PLoS One. 2011;6(10). e26010. doi: 10.1371/journal.pone.0026010. [PubMed: 22022493]. [PubMed Central: PMC3192794]. 14. Suzuki T, Amata M, Sakaue G, Nishimura S, Inoue T, Shibata M, et al. Experimental neuropathy in mice is associated with delayed behavioral changes related to anxiety and depression. Anesth Analg. 2007;104(6):1570-7. table of contents. doi: 10.1213/01.ane.0000261514.19946.66. [PubMed: 17513660]. 15. Mutso AA, Radzicki D, Baliki MN, Huang L, Banisadr G, Centeno MV, et al. Abnormalities in hippocampal functioning with persistent pain. J Neurosci. 2012;32(17):5747-56. doi: 10.1523/JNEUROSCI.0587-12.2012. [PubMed: 22539837]. [PubMed Central: PMC3365570]. 16. Leal G, Comprido D, Duarte CB. BDNF-induced local protein synthesis and synaptic plasticity. Neuropharmacology. 2014;76 Pt C:639-56. doi: 10.1016/j.neuropharm.2013.04.005. [PubMed: 23602987]. 17. Rosa SG, Quines CB, Stangherlin EC, Nogueira CW. Diphenyl diselenide ameliorates monosodium glutamate induced anxiety-like behavior in rats by modulating hippocampal BDNF-Akt pathway and uptake of GABA and serotonin neurotransmitters. Physiol Behav. 2016;155:1-8. doi: 10.1016/j.physbeh.2015.11.038. [PubMed: 26657020]. 18. Duric V, McCarson KE. Persistent pain produces stress-like alterations in hippocampal neurogenesis and gene expression. J Pain. 2006;7(8):544-55. doi: 10.1016/j.jpain.2006.01.458. [PubMed: 16885011]. 19. Saffarpour S, Shaabani M, Naghdi N, Farahmandfar M, Janzadeh A, Nasirinezhad F. In vivo evaluation of the hippocampal glutamate, GABA and the BDNF levels associated with spatial memory performance in a rodent model of neuropathic pain. Physiol Behav. 2017;175:97-103. doi: 10.1016/j.physbeh.2017.03.025. [PubMed: 28336100]. 20. Hu Y, Yang J, Hu Y, Wang Y, Li W. Amitriptyline rather than lornoxicam ameliorates neuropathic pain-induced deficits in abilities of spatial learning and memory. Eur J Anaesthesiol. 2010;27(2):162-8. doi: 10.1097/EJA.0b013e328331a3d5. [PubMed: 19915478]. 21. Yalcin I, Barthas F, Barrot M. Emotional consequences of neuropathic pain: insight from preclinical studies. Neurosci Biobehav Rev. 2014;47:154-64. doi: 10.1016/j.neubiorev.2014.08.002. [PubMed: 25148733]. 22. Castren E. Neurotrophins and psychiatric disorders. Handb Exp Pharmacol. 2014;220:461-79. doi: 10.1007/978-3-642-45106-5_17. 23. Ishikawa T, Yasuda S, Minoda S, Ibuki T, Fukuhara K, Iwanaga Y, et al. Neurotropin((R)) ameliorates chronic pain via induction of brain-derived neurotrophic factor. Cell Mol Neurobiol. 2015;35(2):231-41. doi: 10.1007/s10571-014-0118-x. [PubMed: 25283187]. 24. Alba-Delgado C, Llorca-Torralba M, Horrillo I, Ortega JE, Mico JA, Sanchez-Blazquez P, et al. Chronic pain leads to concomitant noradrenergic impairment and mood disorders. Biol Psychiatry. 2013;73(1):54-62. doi: 10.1016/j.biopsych.2012.06.033. [PubMed: 22854119]. 25. Yasuda S, Yoshida M, Yamagata H, Iwanaga Y, Suenaga H, Ishikawa K, et al. Imipramine ameliorates pain-related negative emotion via induction of brain-derived neurotrophic factor. Cell Mol Neurobiol. 2014;34(8):1199-208. doi: 10.1007/s10571-014-0097-y. [PubMed: 25156823].